First of all, how did you first become involved with the Eon Archive? My first introduction to EON's archive was back in 1986 when I was working in the publicity office with Jerry Juroe for "The Living Daylights". I only saw the tip of the archive iceberg at that time. Later in 1995, we began a comprehensive inventory of everything the producers with the help of Peter Lamont had saved over the years. I got a team together - to identify and organise the large mountain of material that had not been previously identified by the unofficial Bond Fan Club. Could you give us an idea of your duties and responsibilities EON's archivist? My duties and responsibilities cover a wide variety subjects which is really fantastic - there is never a dull moment and always something new to learn. Updating the database, maintaining safe and appropriate storage for the physical assets, valuations, restoration and insurance for these assets make up part of my job. That type of work is never ending because the producers keep making films. Using the assets for research and fact checking for marketing/publicity projects is another aspect. Overseeing the continuation of EON's three Bond exhibitions, photoshoots of archive material for new book publications and archive displays for special promotional or charitable events keep me busy. It must be impossible to keep everything from the filming of such large-scale productions, such as the Bond movies. How do you decide what to keep and what gets discarded? It is difficult. Generally speaking if it is something that can be used for exhibition, film education or future charity auctions - then it is kept. You've had enormous successes with Designing 007 and Bond In Motion. 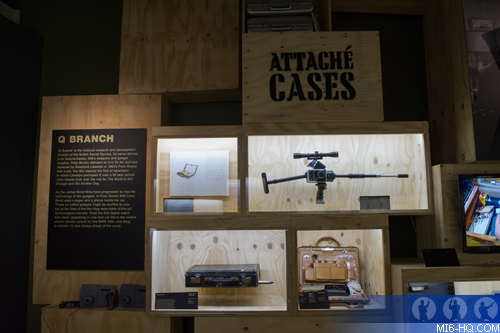 How has this affected your role as archivist and were you surprised by the public response to the exhibitions? It is very satisfying to have the best pieces from the EON archive on exhibit for the public to enjoy and learn from. We learned a lot from previous exhibitions - and as a result our current three exhibitions are all doing very well. Each of them emphasises a different aspect of the Bond franchise and all strive to educate as well as entertain their audiences ("Bond in Motion"; "Exquisitely Evil, 50 Years of Bond Villains"; and "Designing 007, Fifty Years of Bond Style"). You recently authored "Bond By Design: The Art of the James Bond Films". Can you tell us a little bit about how the book came into being? Our publishing department asked me if there was any part of the archive that would have enough content to work as a companion volume to EON's James Bond poster book DK published in 2012. I suggested the vast archive of art department concept art and technical drawings most of which had never been reproduced or published before. They agreed this would make a good companion book and we all took part in editing the content. "Bond By Design" is a beautiful book, very well-researched and informative. Can you tell us about some of the process involved in writing it? 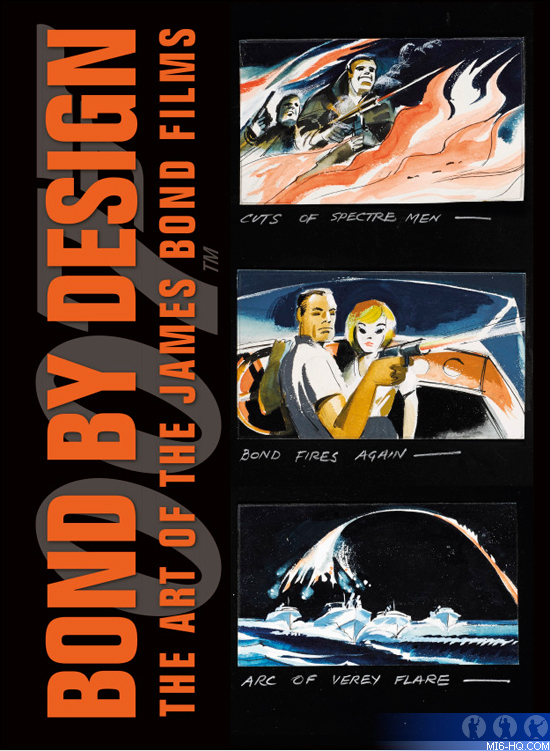 First I re-read or watched any official or authoritative book, magazine article, special feature, original interviews and production notes that had anything to do with the Bond art department. After making copious notes, I spent a lot of time with Sir Ken Adam and Peter Lamont checking facts or asking questions about details that hadn't been covered before. I also spoke with as many of the artists and art directors as I could about their memories and experiences working on Bond. We're there any discoveries made whilst putting the book together? Any stories that stood out? Yes, I discovered some concept art and storyboards from "Thunderball", "You Only Live Twice", "On Her Majesty's Secret Service" and "Live And Let Die" that I didn't know existed and they are now a part of EON's archive and many were used in the book. Finding enough time to research it. My regular duties easily fill each week - so almost all of the research for the book had to be done outside of my regular work hours. There were many all 'nighters' and weekends didn't exist for some time. What did you enjoy most about writing "Bond By Design"? Speaking directly with the production designers and artists about their work. What's been your greatest achievement whilst managing the archive? That's difficult to define - the most satisfying achievements are sharing as much of the archive with the public as possible whether it is through book publications or exhibitions. To be able to introduce people to the details and thought that go into making a Bond story through original storyboards, costumes, gadgets and vehicles is a privilege. I also find great satisfaction in helping with our charity auctions which raise millions for very good causes. In our rather fanciful imagination, the archive is something like Ken Adam's Fort Knox repository set from "Goldfinger". Obviously, it isn't like that, but can you tell us a little bit about the logistics of storing so many props, costumes, vehicles, production artwork, etc.? The material is divided into different locations that satisfy the needs of the material. For instance vehicles are stored in a place where mechanics and transporters are on hand to keep them in good mechanical shape and insure that they can be moved safely when required. The image archive, paper and fabric based materials are for the most part kept in climate controlled environments. Most important is to have a good database - otherwise it is like looking for a needle in a haystack. Recently, Christie's auctioned one of the Aston Martin DB10s from SPECTRE for over £2m, with proceeds going to charity. Similarly, there was an auction of Bond paraphernalia for the 50th anniversary. It must be very rewarding to see so much money being raised. How do you decide on the pieces to be auctioned and can we expect to see more auctions in the future? It is rewarding. I try to recommend archive pieces that we have duplicates of and then the producers make the final choice. Our marketing publicity team get involved, reaching out to our talent, crew members, partners and licensees to participate. Then EON can offer something that is very unique - for instance in the Spectre auction - the set of Rankin photographs signed by the actors and Rankin. Finally, what can we expect in the future? We hope to continue making films that our fans want to come and see and subsequently adding to our achieve!